Japanese referee Yuichi Nishimura has been making waves over a controversial refereeing decision at a World Cup 2014 match. The 42-year-old referee gave a dubious penalty to Brazil over a “ghost” foul by Dejan Lovren on Fred. Neymar proceeded to convert the penalty. This isn’t the first time Nishimura made a refereeing blunder, or was the center of controversy. In the Brazil and Netherlands World Cup 2010 match, he accidentally pulled out a red card instead of a yellow card when calling a foul on Andre Ooijer. Also, in a 2008 African Cup of Nations match between Angola and Egypt, he was pushed by Angolan players and did not send them off. Nishimura was removed from officiating in the remaining matches, and Angola received a 5 year ban. Despite these controversies, Nishimura has won accolades within the refereeing community. He was the Japanese League Referee of the Year in 2009 and 2010, and the Best Men’s Referee of the Year by the Asian Football Confederation in 2012. Nishimura has a wealth of refereeing experience. Some notable competitions he refereed include the Asian Cup (2007, 2011), the Olympic Games (2012), and the Confederations Cup (2013). Here is an Associated Press article on Japanese fans reaction to Nishimura’s blunder. 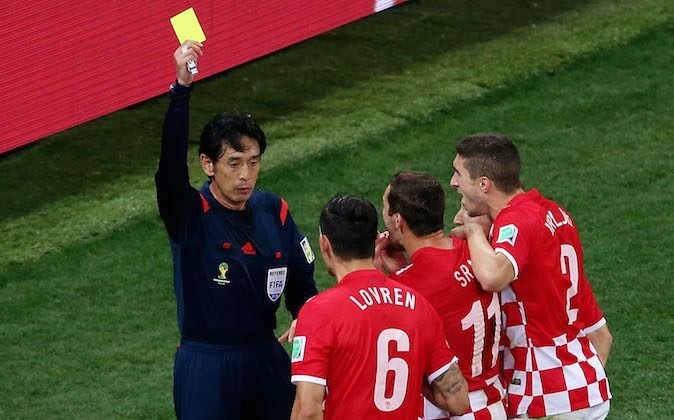 TOKYO (AP) — Japanese football fans took to social media Friday to express regret and shame over referee Yuichi Nishimura’s contentious calls in the World Cup opener, which Brazil came back to win 3-1 over Croatia. Nishimura awarded a penalty when Brazil forward Fred dramatically fell to ground from a slight touch on his upper left arm by Dejan Lovren. Neymar converted the 71st-minute penalty, giving the host nation a 2-1 lead. Earlier in the game, Nishimura showed Neymar a yellow card in the 26th for elbowing Croatia playmaker Luka Modric. Some critics thought the punishment should have been harsher. Some twitter posts featured mocked-up photos of Nishimura wearing a Brazil jersey. Popular singer Hikaru Utada tweeted that she hoped Croatian people wouldn’t dislike all Japanese people because of Nishimura’s performance. Criticism of Nishimura’s penalty decision was shared by Croatia coach Niko Kovac. At the African Cup of Nations in 2008, Nishimura failed to dismiss Angolan players for pushing him during the quarterfinal match between Egypt and Angola. He was not appointed to any more matches in the tournament by CAF. Nichimura worked four matches at the 2010 World Cup but is best known, ironically, for sending off Brazil defender Felipe Melo in its quarterfinal exit against the Netherlands.